There was certainly tension as the time for the delivery of verdict in the 60-year-old Ram Janmabhoomi- Babri Masjid case neared. With partially closed markets and very less traffic, the city wore a deserted look on the day of the Ayodhya verdict today. Residents remained glued to their TV sets and preferred staying home only. A round of the city by The Tribune team found that though in the day the markets were open, there were a handful of shoppers. And as the verdict time neared some shopkeepers shut down their shops. Prior to the final verdict on the Ayodhya issue by the Lucknow Bench of the Allahabad High Court to demonstrate unity and give a message of love, peace, harmony and respect of the decision of the High Court various programmes, rallies, marches and events were held in the pilgrim city. A team from the Centre that was here to assess the damage caused by the recent rains came face to face with the grim scenario in the region. Having been given a statistical and video presentation by the Nainital district administration at the Administrative Training Institute here, the three member team, comprising VK Yadav of the Ministry of Agriculture, Vinay Kymar Bansal of the Ministry of Surface Transport and Raja Shekhar of the Ministry of Water Resources visited the areas that experienced a large-scale devastation. In the Army, adventure is not only a way of life, but also an essential facet of the military training. The Indian Military Academy (IMA), being the cradle of leadership, has excelled in providing an excellent platform for various adventure activities. A cycling team of the IMA that returned to Dehradun after touring North India on Thursday. Left parties, Uttarakhand Parivartan Party and Tanzim-e-Rehnumai Millet in a joint statement have appealed to the public to maintain peace over the verdict announced by the Allahabad High Court. They expressed hope that people of the state would present their true character of harmony and patience. Even as there are growing efforts to minimise man-animal conflict in forest predominant Uttarakhand, the state loses four tigers, 40 leopards and 20 elephants every year. This, when most of the cases of poaching, particularly targeting the feline family, go unreported in the state. The Uttarakhand Forest Department has suffered losses to the tune of Rs 150 crore which include over Rs 29-crore damage at the Corbett National Park in the recent excessive rains in the state. The forest authorities are not ruling out delay in the opening of the Corbett Park that is scheduled for November 15. A day ahead of the Wildlife Week, the Uttarakhand Forest Department authorities, with the assistance of a voluntary organisation, seized five snakes from a training site used for jungle survival training by cadets of the Indian Military Academy (IMA). National champion Lakshya Sen of Almora started his campaign with a win beating Amit Pal of Dehradun 21-11, 21-16 in U-16 boys singles on the inaugural day of the 10th State Sub-Junior Badminton Championship for boys and girls held at multi-purpose indoor sports complex of the Parade Groundm today. Ace racer Pramod of Government Inter College, Bhagwanpur, bagged first place in the boys’ senior 5,000m, 1,500m and 800m race during the Sports and Athletics Competition that concluded at Shri Guru Ram Rai (SGRR) Inter College, Nehrugram. 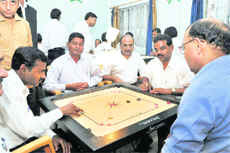 Duo of SS Mehra and SC Gairola entered doubles final of the Bar Association Carrom Tournament here today. There was certainly tension as the time for the delivery of verdict in the 60-year-old Ram Janmabhoomi-Babri Masjid case neared. Residents were glued to their television sets the whole day. 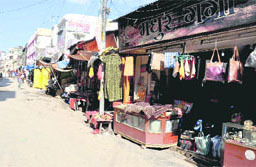 In the afternoon, crowded markets of the pilgrim city, Moti Bazar, Upper Road and Jwalapur, wore a deserted look. But as soon as the decision was delivered and residents came to know about it through the media, the tension defused swiftly. No untoward incident or provoking reaction came from the public with everyone taking the honorable High Court decision with due respect in their stride. The markets, by the evening, again saw the normal buzz returning, thanks to the hard work done by the administration, police and religious-social organisations for the past few days to maintain harmony in the wake of the verdict deferment. News of acceptance of the verdict has been pouring from all sections of society, be it religious bodies or political and social organisations. Everyone seems to be satisfied with the court decision while a few, who were not fully satisfied, said only adhering to legal process was the democratic way as communal harmony was the foremost thing at this testing time. Hindu religious heads, mahants of akharas said the court’s decision was based on the facts and reality and they honoured the decision. Similarly, Muslim organisations have also said they had already said that the court’s decision was binding on all and their efforts in making sure that communal harmony didn’t get affected bore fruits. Meanwhile, Union Minster for Labour and Employment Harish Rawat said as per law and facts the court gave its verdict and everyone should welcome and respect the order. The City Congress Committee termed the court decision as per law and urged people to respect the decision and not hurt the sentiments of anyone. General secretary of organisation committee BS Tejiyan, in a press note, said maintaining peace and secular atmosphere of the country after the decision rest with the responsible citizens and everyone should make sure that religious sentiments of any sect should not be hurt. ROORKEE: Markets and business establishments in Roorkee wore a deserted look as people preferred to remain indoors as the Ayodhaya verdict was being delivered. “Any party in the case which feels aggrieved can always approach Supreme Court as the verdict of the High Court is not the final verdict,” said Qazi Nizamudin, MLA from Mangalore. He also said we welcomed and respect the decision of the High Court and appealed public to maintain peace and tranquillity. Maulana Azhar-ul-Haq said he respected the verdict which had come after 60 years of long litigation. The police force was deployed in strength in the sensitive areas. A flag march was also taken out in the city by the police. Some of the shops were closed at the Paltan Bazar and Rajpur Road. Some even put up the shutter of their shops partially for a few hours. “There are no customers today. Since morning hardly any one has turned up here. The business has been very less in this otherwise busy market,” said the owner of Priyanka Electronics at the Paltan Bazar. Even jam-packed roads of the city had very less traffic. Whether it’s the heart of the city comprising the Clock Tower, Paltan Bazar, Rajpur Road or EC Road, which always have a good flow of traffic, had a few commuters today. Groups of policemen and mediapersons were to be seen at the most of the junctions. 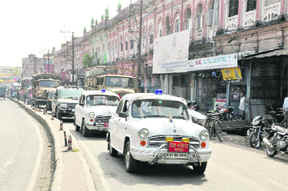 “The traffic was 30 to 40 per cent lesser in the city than on a normal day. 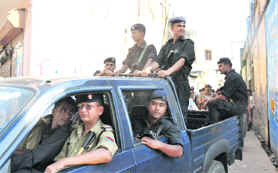 Though markets are open there are very a few customers,” officiating Superintendent of Police Ajay Joshi told The Tribune. Meanwhile, till the filing of this report the situation has been peaceful in the city. Hours before the Allahabad High Court delivered the verdict on Ayodhya, a flag march led by District Magistrate and Senior Superintendent of Police was carried out in the city. 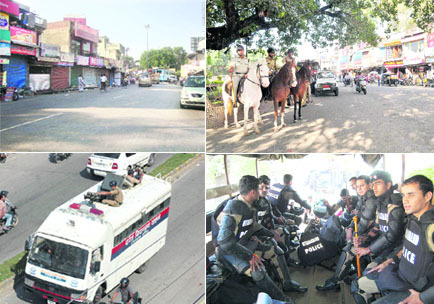 To make its presence felt in the state capital, a convoy of the police force with two officers, a quick reaction team and crowd control vehicles passed through various areas of the city. The march was taken out from the police control room to Mehuwala covering sensitive places of Dehradun like Innamullaha Building-Clock Tower, Chakrata Road-Balupur Chowk, GMS Road-Shimla Pass and it culminated at Mehuwala. The march was carried out peacefully and the authorities did not anticipate any breach of peace. However, at the Balupur Chowk, the police intercepted a group holding the 21st Geeta Gopal rally who were dressed in religious attires and were distributing pamphlets of awareness on global warming. The police interrogated them and found that they were on a rally for a past few days like every year and were returning to Ambala today. The police asked the group members to change their clothes before allowing them to go from there. Prior to the final verdict on the Ayodhya issue by the Lucknow Bench of the Allahabad High Court to demonstrate unity and give a message of love, peace, harmony and respect of the decision of the High Court various programmes, rallies, marches and events were held in the pilgrim city. People from various sections of life, irrespective of their religious affiliations, not only participated, but also organised these events as part of giving a message of peace and tranquility among not only Hindus and Muslims, but also among people of other religions too. So while Muslims offered water, food, sprayed Hindus with petals when peace rallies passed through mosques, madarsas and their colonies, similarly they were given a warm reception when they neared Hindu temples and ashrams. The whole Maha Kumbh city presented a scene of mutual love and communal harmony which has for decades been the unique quotient of this pilgrim district which houses Hindus’ world-famous Har-ki-Pauri in Haridwar and revered Piran Kaliyar in Roorkee. Both of these pilgrim places are visited by millions of people every month. Sikhs, Christians, Jains and other sects of people also participated, lending support to the administration in its bit to make sure that peace prevails after the verdict is announced. The Ayodhya issue also brought together political rivals on the same platform, which is rarely seen these days. So while Union Minister of State for Employment Harish Rawat, who is also Congress parliamentarian from Haridwar, led one of the peace processions, former Samajwadi Party stalwart Ambrish Kumar too lent full support in ensuring that the peaceful atmosphere in the pilgrim city didn’t get diluted. Bharatiya Janata Party district unit members too participated in full strength signifying that irrespective of the three-member judicial Bench decision, no one will try to break or encourage peaceful atmosphere of the district. At Jwalapur-situated Jama Masjid, the atmosphere didn’t seem tense with just the presence of police and paramilitary personnel giving a feeling that something might happen. Here, just near to this mosque, Hindus organised a refreshment stall for Muslims. “Irrespective of the decision, we have to make sure that we will be maintaining the mutual admiration and communal harmony prevalent in Haridwar for decades. During Eid my Hindu friends come to my home, while on Deepawali I am delighted to celebrate with them. So why should we view the judgement as inviting trouble and hatred ?” said Anees Khan, a BHEL resident. A team from the Centre that was here to assess the damage caused by the recent rains came face to face with the grim scenario in the region. 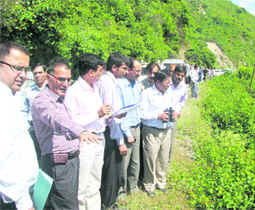 Having been given a statistical and video presentation by the Nainital district administration at the Administrative Training Institute (ATI) here, the three member team, comprising VK Yadav of the Ministry of Agriculture, Vinay Kymar Bansal of the Ministry of Surface Transport and Raja Shekhar of the Ministry of Water Resources visited the areas that experienced a large-scale devastation. The team first went to the Bhumiadhar area where a road stretch has sunk and a large number of structures, including schools and houses, that have developed cracks. Thereafter, the team was taken to Bhawali where they were shown the three bailey bridges because of which the essentials are being supplied from Bhawali to the hill districts of Pitthoragarh, Bageshwar and Almora. The team then went to the worst-affected area near Garam Pani where the Nainital-Almora highway stands washed off. A large number of residents of the worst-affected villages had gathered there hoping that the officials would provide them some instant relief. They were disheartened to know that this was just an assessment team from the Centre which would present its report to the Central government. The team had a firsthand experience of the devastation in the Betalghat Block of Nainital district that has been affected on a large scale. This block is known for its agricultural produce, mainly paddy and vegetables that are supplied to the adjoining states and the national capital. What stands today is large tracts of fields washed out by the Kosi river that had changed its course when the disaster struck on September 18. The people in this part stood helpless as they related how much they had suffered and the way development process had been hit in this already backward area of the district. The potable water schemes have been the biggest casualty in this region. The team was told about the devastation of the Kosi Lift Drinking Water Scheme that was supposed to be the lifeline of the region. The team was told that 101 houses had been devastated in the district while 2,116 residential buildings have been partially destroyed. While 20 persons have died, 15 have sustained injuries in the rain-related incidents. According to officials, 50 per cent of agricultural produce has been completely destroyed. The team proceeded to Haldwani to visit the destroyed bridges and roads that connect the town to the vegetable-producing hub of Gaula Par. The members were then to fly to the Shakti Farm area of Udham Singh Nagar district. Pitthoragarh (OC): A Central government team visited calamity-hit areas of Pitthoragarh and Champawat districts. The team conducted an aerial survey of Qurie-Jimia and La-Jhekla villages of Munsiyari subdivision, the Gunai area of Gangolihat and parts of Pitthoragarh subdivision and the Tanakpur- Banbasa area of Champawat district. “The team, comprising Dr SK Chaudhari, from the Union Health Ministry, Ramraj Meena, from the Union Ministry of Rural Development, Vivek Goyal, from the Ministry of Power and Mukesh Sharma, from the Ministry of Power, held a meeting with district-level officers from Pitthoragarh and Champawat and took stock of the rehabilitation measures being taken up by the district administration and real losses shown to them at a video presentation,” said NS Negi, District Magistrate, Pitthoragarh. The team left for Almora after lunch. A cycling expedition that was flagged off from the academy on September 18 returned today. The expedition was flagged off by Major-Gen Gurpal Singh Bal, Sena Medal, Vashisth Seva Medal, Deputy Commandant and Chief Instructor, IMA. The expedition team got on their mountain bikes and cycled through narrow paths showcasing endurance and team spirit on route Dehradun-Chandigarh-Jalandhar-Patiala-Dehradun covering a distance of 806 km in eight days. The team comprised three officers and 15 gentlemen cadets of the IMA, led by Major PS Bajwa as the team leader, Capt Vevek Ahlawat as the deputy team leader and Capt Sangwan as a team member. The team visited schools and colleges en route to create awareness among students about Army life by distributing pamphlets about various entries and prospects in the Army and encourage youth to join it. The IMA has conducted a large number of adventure activities in the past. This year itself, the IMA has successfully conducted the mountaineering expedition to Mt Jogin I (6,465 metre) in a record time and rafting expedition from Rudraprayag to Shivpuri covering 132 km in four days. This feat has added another feather in the diverse adventure activities being conducted by the IMA to inculcate the spirit of adventure and comradeship. The IMA Cycling Club has also participated in various competitions such as Delhi Cyclothon held on August 29, ONGC cycling rally held on August 14 and I-Next Bikerthon Season III, on September 19. The meeting was attended by state secretary Vijay Rawat, district secretary Surender Singh Sajvan, member of the state committee Virender Bhandari, state secretary of CPI Samar Bhandari, Tanjim-e-Rehnuma’s representative Latafat Hussain and many others. 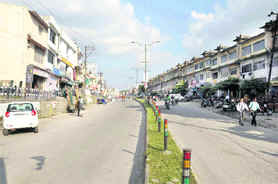 Meanwhile, with fear factor playing on the minds of residents of Doon, courtesy local television channels that went in an overdrive days before the Ayodhya verdict, the streets wore a deserted look on judgment day today. In fact, if morning hours saw thin traffic by mid-noon, life seemed to come to a standstill as the common man kept off the streets and shopkeepers downed their shutters as though obeying a different order based on fear and general tendency to avoid any untoward incident. At bustling market places, a few people could be seen discussing the fallout of the judgment, others seemed happy to just laze and were pleased with the rush-free atmosphere prevailing. “I had opened my shop in the morning, but now I am going home for my afternoon nap,” said Rajeev Rawat, a local shopkeeper of Dharampur market. “I do not know, if it was intentional, but word went around that schools and shops would be closed today. But we managed to confirm with the school authorities that they were open,” said Rajni Dwivedi, a housewife. However, by evening life was back to normal as streets began to fill with vehicles. Most seemed relieved, others remained oblivious of the judgment. “It is too technical. I have no knowledge about the technicalities involving the judgment all I want is peace,” said Dina Nath, a senior citizen. After the verdict of the Allahabad High Court on the Ayodhya case, state office-bearers of the All-India Hindu Personal Law Board, at a meeting held here today, welcomed the judgment of the court. The members of the board have appealed to the masses to maintain peace and harmony across the country. Present on the occasion were Dr Vijay Garg, state president, Neelam Sehgal, convener, Ashok Gupta, under secretary, Amardeep Jaiswal, media coordinator, Sushil Upadhyay, Krishna Pal Singh, Suresh Chandra, Mohit Jaiswal, Deepti Sangolkar and others. According to the Uttarakhand Forest Department’s latest statistics, 186 wild animals belonging to species of leopards, elephants and tigers have died in the past one decade in Uttarakhand and the forest authorities attributing most of these deaths to natural causes. They also claim the presence of 240 tigers, 2,000 leopards and 1,550 elephants in the state and on the basis of it recorded four tiger, 40 leopard and 20 elephant deaths in the state every year. Interestingly, out of total of 48 tiger deaths that have taken place in the state in the past one decade, 36 have faced natural deaths while nine have been subjected to mishaps while a paltry three have been poached. As many as three tiger deaths have already been recorded this year which includes a case of poaching and a mishap. In case of leopards, the deaths have been unprecedented. As many as 544 leopards have died in Uttarakhand in the past one decade that include 333 natural deaths, 157 due to mishaps while 54 have been hunted. Fortynine leopards have already died in 2010 which includes seven cases of poaching. Eighteen elephant deaths due to mishaps have been reported this year so far. Another important species of Uttarakhand wildlife, pachyderms are no less vulnerable. As many 186 of them have died since 2000. While 99 due to natural reasons, 71 have died in mishaps. Fifteen elephants have been poached. In the present year itself, 15 elephants have become victims to poachers while 71 have died in mishaps. Uttarkhand has already lost six elephants this year which involves five deaths due to mishaps across forest areas of the state. Uttarakhand Wildlife officials said the mortality rate of tigers, leopard and elephants were certainly not alarming and was far below the danger mark. They, however, admit that making wildlife conservation a people issue will be a big challenge for the state. More importantly, the death figures recorded with the state wildlife authorities are mostly underestimated and the deaths of these key species could be much higher than what has been revealed in the statistics. On the other side of it in terms of human causality, 302 persons have died while and 811 others have been injured in wild animal attacks since the formation of the state of Uttarakhand on November 9, 2000. According to Uttarakhand Chief Wildlife Warden Srikant Chandola, there have been efforts to minimise the increasing man-animal conflict cases in the state. A series of measures, like doubling of ex gratia amount to the kin of the victims of wild animal attacks has been taken. Now, in case of death of an adult, an amount of Rs 1 lakh is provided to the family members of the victim. Similarly, the divisional forest authorities have been entrusted with the powers to neutralise wild boars and neelgais that were major cause for damage to the crops in parts of Uttarakhand. Tranquiliser guns and other equipment have been made available at the DFO level for a better dealing with wild animals that go berserk at times. Rescue centre for wild animals have been set up in Haridwar and Almora forest divisions. Schemes are also in the offing to improve habitat with reserve forest areas to check incursions of wild animals in the village settlement in close proximity of forests. As much as 14 per cent of the entire Uttarakhand is forested and 14 per cent out of this area falls under wildlife reserves. Addressing a media conference a day ahead of the start of the Wildlife Week celebrations, the Principal Chief Conservator of Forests, Dr RBS Rawat, said the rains had caused extensive damage to the forest department infrastructure all across the state. He said approximately 25 per cent of connecting forest roads have been damaged due to the rains. “A total of approximately 1,200 km of roads have been damaged in the rains,” Dr Rawat pointed out. He said the damage to the Corbett had been extensive with culverts and forest kutcha roads getting washed out and even rest houses needed immediate repairs. Referring to the role of the Forest Department in providing assistance in relief and rescue, Dr Rawat said at the first instance, leaves of forest officials were cancelled followed by opening of department shelters, rest houses and forest chowkis for relief purposes. He also pointed out that the department was providing disaster management kits at every forest division. 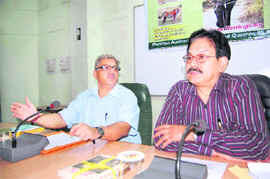 Uttarakhand Chief Wildlife Warden Srikant Chandola, however, denied major losses to wildlife. “Wild animals have remarkable instinct to make an escape when in distress and death of animals could not be in proportion to death of domestic animals,” Chandola pointed out. He also said the various programmes would be organised by the Uttarakhand Forest Department as part of the Wildlife Week celebrations. Apart from various workshops and competitions, jungle safari for senior government functionaries and an address by George Schaller, leading wildlife biologist of the world, will be the highlights of the celebrations. Chief Conservation of Forests Wildlife Paramjeet Singh was also present at the press conference. 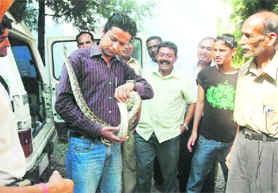 A snake caught from the IMA campus in Dehradun on Thursday. Three rat snakes, a Burmese python and a cobra were among the snakes seized by the forest authorities. A snake charmer was also arrested by the police. Members of NGO Endangered Flora and Fauna on Earth Conservation Team (EFFECT) had received information that snakes were being supplied by local snake charmers to the IMA for use in jungle survival training. Chief Conservator of Forests Jairaj and Dehradun Divisional Forest Officer Meenakshi Joshi and members of EFFECT raided a site in Jhanjra, being used for jungle survival training for IMA cadets, and seized the snakes. According to IMA spokesman Major Amit Dagar, all these snakes are used for jungle warfare training, which holds much importance for gentlemen cadets who face a hostile environment while dealing with insurgents. “Gentlemen cadets confront snakes while dealing with conflicts in insurgency-hit areas and, thus, it is very important to acclimatise these cadets with such situations”, he pointed out. Meanwhile, Dehradun forest authorities sources disclosed that the department has confiscated five snakes being used for training cadets and has also taken local snake charmer in to custody for supplying the serpents to the IMA. While another Dehradun lad Puneet beat Anshul Sood of Udham Singh Nagar 21-15, 21-8. In the U-13 boys singles, Prashant of Haridwar defeated Lalit of Udham Singh Nagar 21-19, 21-13. Ujjawal Dobhal of Dehradun beat Varun of Haridwar 21-13, 21-7. Shivam Raturi (Dehradun) registered win over Ujjawal Khali (Tehri) 21-8, 21-6. While in U-16 girls singles, Sweta Rawat (Udham Singh Nagar) beat Anustha (Dehradun) 21-10, 21-19. Smriti (Almora), too, defeated Himanshi (Dehradun). In U-13 girls singles, Katyani beat Rishika (Haridwar) 21-2, 21-9. The matches were played in the U-13, U-14 and U-16 categories for boys and girls. Association secretary Navneet Sethi said state team would be selected from this competition that would participate in the forthcoming national championship. While in the 5,000m senior girls race, Jyoti of SGRR Maldevta stood first. In discuss throw event, Amit got the first place. Diksha stood first in the 200m junior girls race. In seniors 200m race, Usha got the first place too. Deepak and Lalit got the first place in the high jump event. Meanwhile, the winners were given prizes during the prize distribution ceremony held at the school. Students participated in a large number during the competition. The pair beat LB Gurung and Neeraj Thapa in straight sets 29-4, 29-14. Organisers said other two matches, which couldn’t be completed yesterday, would be played later since these are held in accordance with the working schedule of the advocates.